This instrument tells the time by day or night anywhere in the world. 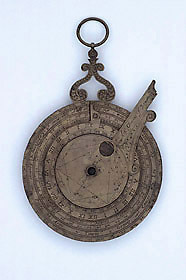 The combination for this purpose of a nocturnal and an unusual type of altitude sundial is the same as that on the instrument made in Antwerp by Michiel Coignet at a similar period. These Italian and Flemish instruments can be linked with practical mathematics in France, as the standard account of the dial was published by Oronce Fine of Paris.